Fall is my favorite time of year! I love the cooler temps and getting to cozy up a bit with scarves and boots. Fall is the BEST time of year to live in Wisconsin. The weather is perfect. To celebrate the beginning of fall, I put together a group of talented bloggers to share their fall home tours this week! I got a sneak peek of the pictures, and they’re gorgeous. For some great fall decorating ideas, be sure to check out the other home tours at the bottom of this post. If you’re hopping over from one of the other bloggers, welcome! I’m so glad you’re here. 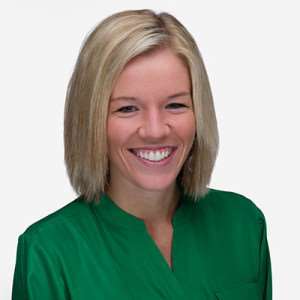 My husband Kalen and I live outside of Milwaukee and did major renovations on our house. It was a total fixer upper when we bought it. You can learn more about me on my About page. I tried to list sources for almost everything in our house since that’s the question I get most from readers, but if there’s something you like that I didn’t link to, just let me know! I usually try to decorate without spending a lot of money, so some finds are from TJ Maxx, HomeGoods, etc. I can’t link to those, unfortunately, but I try to link to similar products if you want to get a similar look. Speaking of, I found this wreath on clearance at TJ Maxx at the end of the season last year. One of my absolute favorite ways to decorate for different seasons without spending a lot is shopping the clearance aisles at the end of every season. You can save a lot of money! The only bummer is then you have to wait a year to decorate with them. I’ve had this wreath sitting in the basement since last November, and I’m excited to finally break it out. I finally painted our banister white a few months ago, and I love it. That little Halloween sign on the closet door knob is pretty much as spooky as it gets around here. I love fall but Halloween? Not so much. Here’s our little foyer. Boots and scarves are two of my favorite things! I’m so excited to break them out, even if the weather isn’t quite cool enough yet. Our foyer opens right into our living room, and I have a surprise! We just got this new green area rug, and I’m in love. I have a blog post coming up about it, so I won’t talk about it too much today. But it’s safe to say I’m obsessed. Our living room is always one of my favorite rooms to decorate for different seasons. The mantel and ladder shelf are perfect for easily switching things out. I can’t get enough white pumpkins this time of year! That little Wisconsin sign is new. I love it! I just framed that metal pig to make it stand out on the wall a little more. I love what a difference it makes! If you follow me on Instagram, you know I love this DIY fall pillow I made last year. I just dried some hydrangeas from my Grandmom’s yard, too, which was so easy! I love how they look. I put some fake leaves on the coffee table. I went upstairs to shower the other day and came back down, Oakley had spread them all over the floor. She usually leaves our stuff alone, but apparently she’s not into fake leaves. I have my painted desk in the living room, too. It used to be my grandparents’. I found this old chair for $4 at an estate sale earlier this year. It needs a coat of paint. (Update: see the painted chair here!) The project list is never-ending around here! Moving into the kitchen … I LOVE white kitchens. We did a kitchen renovation before we even moved in. We knocked down a wall, rearranged the layout, painted and got new cabinets, counters, backsplash, appliances and faucet. Fruit is one of my favorite free ways to ‘decorate’ for seasons. What’s more fall than apples?! I like to use old bottles as vases, too. That bottle in the corner is a fun shape. This is my favorite room renovation we’ve done. I love the bright white cabinets and all the counter space we have. This little wooden crate was from the dollar section at Target last year. Who else is addicted to that section?! It’s the perfect spot to stroll through for some fall decorating touches! I love this little corner of the kitchen. I updated the message on the cork chalkboard (finally!) for fall. These little Moscow mule mugs are perfect to decorate with when we’re not drinking out of them. I love how cold they keep drinks! Confession: that tray was a rummage sale find last year. I love the wood and the black handles, but the face of the tray has a weird painted design on it that I need to do something about. For now, I took the easy way out and covered it in leaves. I love this wheat grass with the green in it! I found it at TJ Maxx the other day. We spend the most time in our family room, which we also did renovations to. This room seems the most fall-ish to me with the reds and tans, but I could never give up the green in the rest of the rooms of the house. 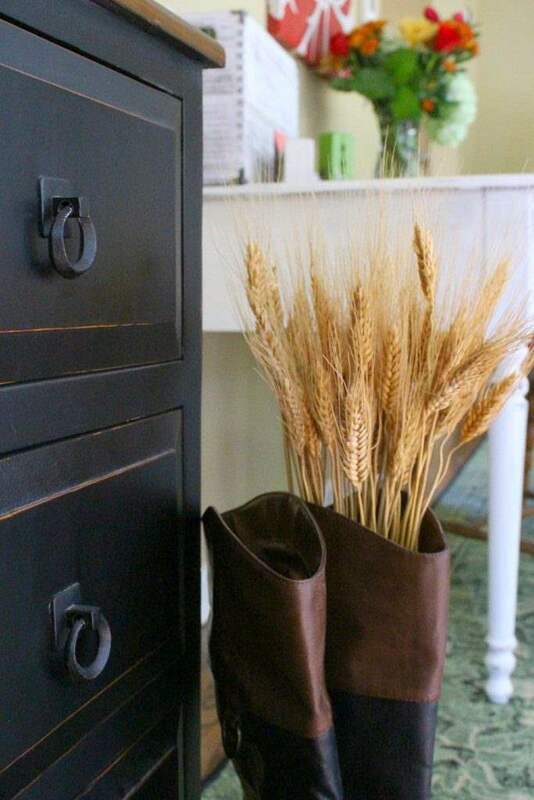 I love the rustic ladder! It was in the garage when we bought the house, and it was in ROUGH shape. I sanded and sealed it. I love having cozy blankets around, and now that fall is here, it’s finally seasonally acceptable to have blankets out all the time! We watch a lot of football in here every fall. I’m surprised a football hasn’t made an appearance in this room yet. Every fall, Kalen’s football gets treated like a throw pillow and finds its way onto the couch or a chair. I added a little fall to our bathroom, too. My brother Stephen knows I’m not the biggest Halloween fan and got me this towel as a joke years ago. So of course I have to put it on display every year as part of my fall decorating! The vase ended up there on accident. I was carrying too much heading down to the basement, so I put the vase on the sink for a second. When I came back upstairs, I liked it there so I left it. Love when that happens! We’d made a handful of those vases for centerpieces as our rehearsal dinner years ago, and I kept a few of them. Love to reuse pieces! Here’s a peak at our fall patio. We use our patio well into the fall. With the fire going and a blanket, it’s perfect even when it starts to get a little cooler. You can see more of the patio all decorated for fall here. I don’t usually add much seasonal decor upstairs, but here are the most recent photos of the rooms up there if you want to look around. This is one of my favorite headboard ideas. We did a big renovation in here, too, including adding a second vanity. The room was full of old coral tile when we bought the house! The office is up here, too. And guess what?! We’re FINALLY getting around to finishing that room. I know I’ve been saying that forever, but it’s true this time. I’ll start sharing more about the home office in early October. Remember to head on over to the other bloggers’ beautiful fall home tours for more fall decorating ideas! You can also fall along on Instagram by searching #hometourgwd. Wow Meg! Your Fall home is beautiful. We love all of your special touches throughout the house. We especially love the Moscow Mule corner! We better get busy to be ready for our tours LOL! Thanks, ladies! The Moscow mule corner was fun to put together! Can’t wait to see your tours! Your home looks just lovely Meg! I really love the pops of color throughout your home-especially the green! Thank’s for hosting this great Tour! Meg, I love the white banister and the dried hydrangeas. It’s all making me excited for Fall. Love all the pops of green too. 😀 Thanks for hosting this tour!! Thanks, Yuni! I just love fall! Can’t wait to see your tour. Beautiful home tour, Meg! I love hydrangeas too and the ones you have dried looks amazing. Your home is definitely ready for fall entertaining! Thanks for sharing. Thanks, Tee! It was so easy to dry the hydrangeas, I’m glad I tried it this year. Your home looks so beautiful all decked out for fall! I’m addicted to white pumpkins, too. So cute! And I LOVE your new rug! Thanks, Samantha! White pumpkins are so much fun. I love the rug, too – I just keep staring at it, ha! Beautifully done, Meg. I love your use of florals and I am in love with your chalkboard vignette! Can i come over and have a moscow mule? haha By the way, the white banister looks great. Thanks, Erica! Too bad you’re not closer for some Moscow Mules together, ha! So pretty! Your whole home looks perfectly ready for fall! I have been loving dried hydrangeas, too. Your home looks beautiful Meg! I love how you’ve decked it out for fall, especially your fall-themed chalkboard & your Moscow Mule mugs (aren’t those perfect for *every* season?? haha!). Thanks so much for coordinating these home tours and inviting me to join in! Wow you have been busy the house looks beautiful, I love the pumpkin pillow and all your stencil projects. Its a true lovely fall home. Thanks for organizing the tours Meg, your home looks just beautiful!!! I was a little surprised your front door is red though, and not green! lol. Pinned! It looks SO good, Meg! And the pictures look awesome! Thanks again for putting this tour together — I had so much fun decorating! Thanks, Heather! Love your tour, too. I always love decorating for fall! Thank you for hosting the hop, Meg! Your home is always so fresh and beautiful. I love all your fall touches! Love your red front door and your beautiful wreath Meg! So many pretty fall decorations too. Thanks so much for hosting the tour! Thanks, Tara! I’m so glad I found that wreath last year! As always, it’s so lovely Meg! Thanks for hosting this wonderful tour!! Everything is beautiful Meg! So cozy and welcoming. Thanks for hosting! Thanks, Jenna! Everyone’s house is gorgeous, it’s been such a fun tour to host! I’m coming over for a Mule!!! 🙂 Great tour, Meg! Your house is definitely ready for fall! Thanks so much for organizing this fun tour! I am so glad I got to participate. Meg! Thanks for organizing such a massive blog hop. I love all of this inspiration!! Your new rug is fabulous and all of the Fall details here and there are super cute and fun. Your home is always gorgeous! Love the fall touches you added this year! Love your home Meg! Your old window display is beautiful with all your family photos! Thank you for organizing! Pinning! Thanks, Cat! It’s still one of my favorite DIY projects! 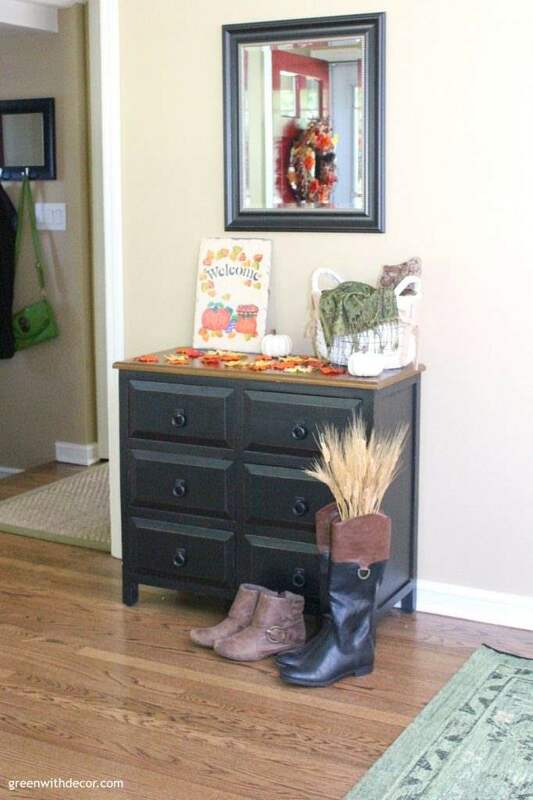 Hi Meg, your homoe looks beautiful for Fall and I loved scrolling through your home tour! Thanks so much for sharing it, can’t wait to have time to look at all of the other homes on the tour! Have a good evening! Thanks, Nicki! Have a good night, too! Loving these fall touches Meg! I love copper for fall and so want those copper mugs! Completely perfect for that beautiful outdoor oasis too. Thanks so much for organizing this hop! Thanks, Steph! I love the copper mugs for every season, haha! Your tour is so cheerful and inviting, Meg! Thank you so much for organizing this awesome tour! Love your tour! You go all out and it’s inspiring! I love how there are touches of fall nearly everywhere! It’s homey and warm and pretty! Thanks for sharing and organizing such a fun tour! Your home looks amazing! I love the fall decorations, so simple and classy! Thanks so much, Rachael! Glad you could join in the tour! What a great tour, Meg! 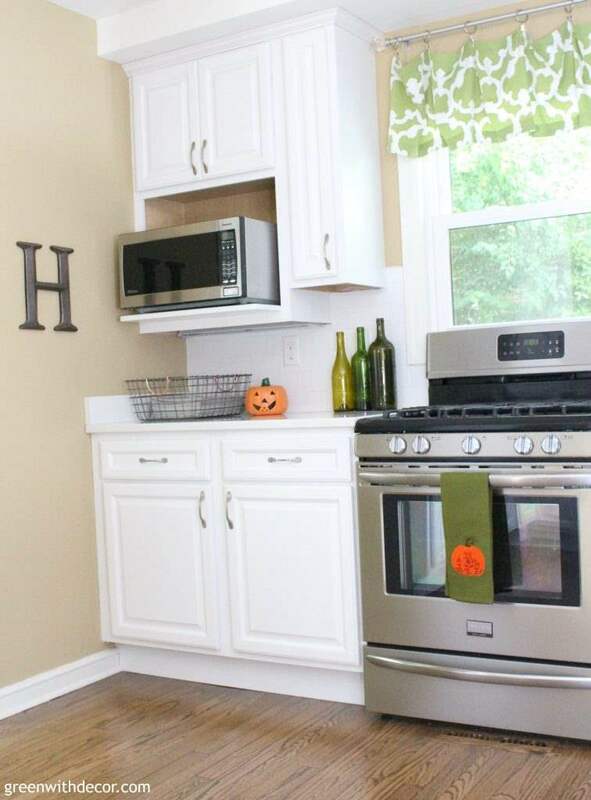 I love all the touches of fall you added throughout, especially in your beautiful kitchen. Thanks so much for hosting the tour–it was full of inspiration and a lot of fun!